Two political scientists calculate the probabilities. The Supreme Court has reinserted itself in the heart of domestic politics by agreeing to review the Patient Protection and Affordable Care Act (PPACA). How is the Court likely to rule? Consider two scenarios. The first scenario relies on a prominent theory of judicial decision-making called the attitudinal model. It holds that justices are unconstrained policymakers. To predict and explain Court actions we simply need to figure out the policy implications of the legislation and justices policy preferences. The vote takes care of itself from that point. In our recently published book, The Constrained Court (you should buy it here—think holiday stocking stuffer), we use politicians’ positions on Court cases to “bridge” preference estimates making them comparable across Congress and the Supreme Court (see here for more details). 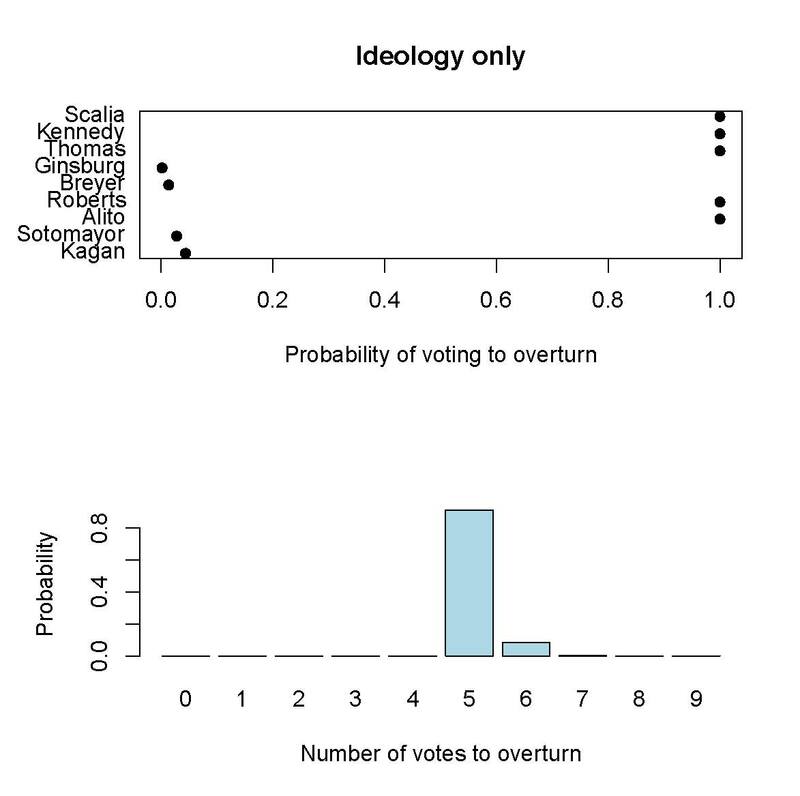 Applying this technique to the PPACA we can estimate probability that each justice would vote to overturn the law if ideology were the only factor. 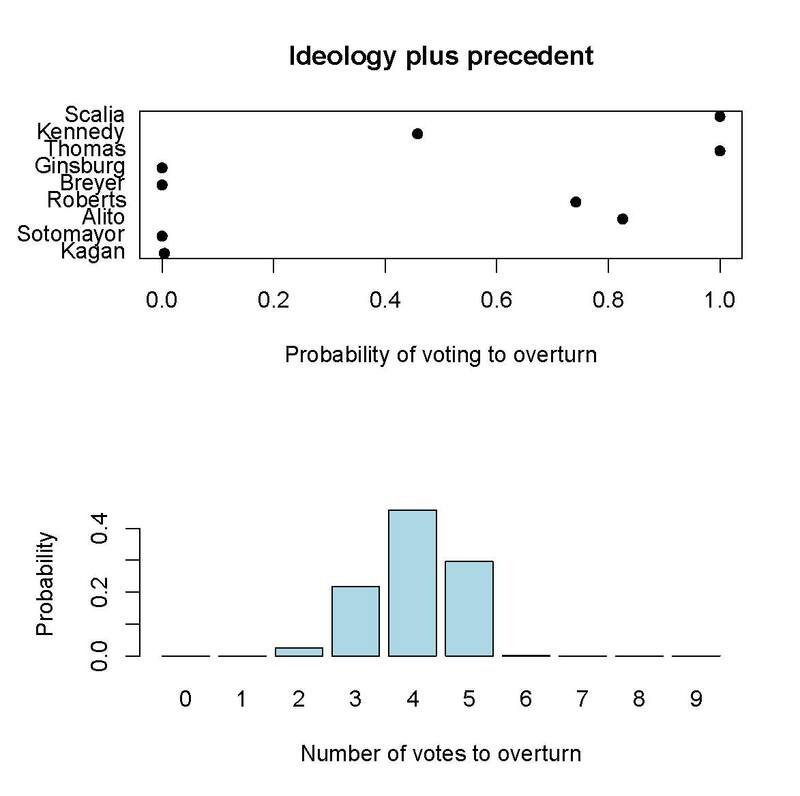 Based on preferences alone, 5 justices, including the “swing” justice Anthony Kennedy, are predicted to vote to overturn the PPACA—as depicted in the top graph below. In the graph immediately below it, we calculate the probable vote margin. The most likely scenario is a 5-4 decision overturning the PPACA. Under this scenario, the Court would be a lock to overturn. Goodbye Obamacare. But consider a second scenario. We (and many others) think there is more to justices’ behavior than policy preferences. Justices have famously bucked their presumed policy preferences on high-profile cases—such as when Rehnquist supported Miranda rights in Dickerson v. United States based on support for precedent and Scalia supported flag-burners (whom he openly admitted he’d like to see in jail) in Texas v. Johnson based on support for First Amendment speech rights. We show in our book that virtually every justice deviates from their policy preferences in favor of one or more of several prominent legal values such as respect for precedent, although the justices differ in how much they value precedent. In considering the possible role of precedent, what precedent(s) should we take into account? This is not a simple question. While United States v. Lopez and United States v. Morrison offer possible precedents, we are persuaded that the Wickard v. Filburn and Gonzales v. Raich are most clearly relevant (as argued, for example, in conservative Judge Laurence Silberman’s DC Circuit decision upholding the law). Given that precedent established by Wickard and Gonzales is supportive of upholding the law, we then calculated the predicted vote of each justice based not only on their policy preferences but based on their tendency to defer to precedent. Deference to precedent varies by justice: Kennedy does so much more than Thomas, for example. More details on the underlying method are here. Kennedy’s predicted behavior shifts dramatically, going from a certain vote to overturn the PPACA in the ideology-only model to only a 46% likelihood of voting to overturn when we factor in precedent. Roberts and Alito also shift, although not so markedly. In the second graph, the probability of overturning the law is therefore much lower (30%). Forrest Maltzman is a professor of political science at George Washington University, where his research and teaching focus on American national institutions.